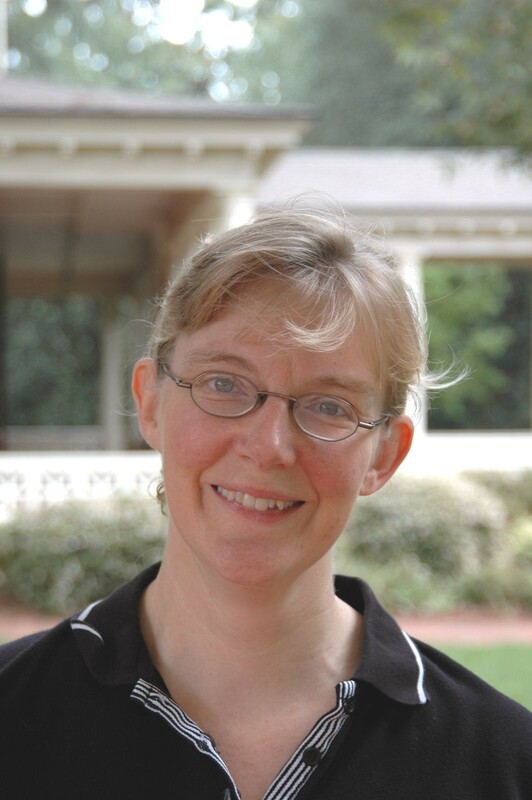 Amy Lovell is Associate Professor of Physics and Astronomy at Agnes Scott College. She volunteered to be the next of the 51 Women in Planetary Science — and we’re so glad she did! Lovell has worked at a number of different observatories; please read on for more! Abstract: Thermal observations of large asteroids at millimeter wavelengths have revealed high amplitude rotational lightcurves. Such lightcurves are important constraints on thermophysical models of asteroids, and provide unique insight into the nature of their surface and subsurface composition. A better understanding of asteroid surfaces provides insight into the composition, physical structures, and processing history of these surviving remnants from the formation of our solar system. In addition, detailed observations of the larger asteroids, accompanied by thermophysical models with appropriate temporal and spatial resolution, promise to decrease uncertainties in their flux predictions. Of particular interest are the near-Earth objects, which can be observed at large phase angles, permitting better assessment of the thermal response of their unilluminated surfaces. The high sensitivity of ALMA will enable us to detect many small bodies in all the major groups, to obtain lightcurves for a large sample of main-belt and near-Earth objects, to resolve the surfaces of some large objects, and to separate the emission from primary and secondary objects in binary pairs. In addition to the science goals of asteroid studies, these bodies may also prove useful operationally because those with known shapes and well-characterized lightcurves could be employed for flux calibration by ALMA and other high frequency instruments. As a child I enjoyed field trips to museums and planetariums, but I didn’t have much interest in science until my freshman year of college, when I took astronomy for the first time and really loved it. 2. How did your summer undergraduate research experiences affect your decisions about graduate school? I enjoyed two wonderful summer research experiences: the first at Maria Mitchell Observatory in Nantucket where I studied variable stars, and the other at Cornell University where I worked on Arecibo Radar observations of Venus, in preparation for the Magellan mission. Both experiences helped me know that I liked research, and enjoyed the observational side of astronomy. My trip to Arecibo helped me know I was interested in radio astronomy and in planetary science. I was also fascinated with the observatory environment and the wide array of things that go on in research facilities. I think the most important thing about my summer experiences was the helpful advice and encouragement of my mentors, Lee Belserene at Maria Mitchell and Don Campbell at Cornell. 3. How do you balance research with teaching and mentoring at Agnes Scott? My job at Agnes Scott involves a lot of one-on-one interactions with students. I teach five courses each year and also work outside class with students who need help or who are doing independent research. I devote most of the summer to research, but can only make a little time for research (such as writing abstracts, writing and reviewing proposals, or attending meetings) during the school year. I like to travel in the summer to go somewhere I can concentrate on observing or data analysis. In some cases, I’ve been able to take students along with me on summer research trips. Balance is hard to achieve, usually I’m either in teacher-mentor mode or I’m in research mode, and not often both. 4. Tell us a little about your research experiences in Mexico and Puerto Rico. In 2004, I spent January through July in Mexico at INAOE (Instituto Nacional de Astrofísica, Óptica y Electrónica) in Puebla. INAOE is in partnership with the University of Massachusetts in building the Large Millimeter-wave Telescope (LMT). While I was there, I mostly worked with data I already had in hand, but I also enjoyed the chance to advise a couple of graduate students, an experience that I don’t get in my home institution. After I received tenure, I was granted a year-long sabbatical leave and was able to go for a full year to Arecibo Observatory in Puerto Rico. While there, I was able to plan and carry out a number of observations of comets in addition to working with the staff to learn more about the capabilities of the telescope and other research going on there. In both of these research trips I have been able to relocate along with my entire family, so the kids were in school one semester in Mexico and a full year in Puerto Rico. 5. What is your current research? I am continuing a 10-year project to study OH emissions (at 18cm or 1667 MHz) from comets. We are using the data to understand how much gas is produced by each comet, how it varies with time (if possible), how fast the gases are escaping from the comet, and if there are any interesting asymmetries in how the gas is produced. We have a variety of data on long-period and short-period comets, observed with the Arecibo 305m radio telescope and with the 100m Green Bank Telescope (GBT) in West Virginia. Recently, we’ve also had the opportunity to investigate several icy asteroids to see if they might be producing any gas, or acting like comets in some way. In addition, I have been involved with a program to observe thermal emission of asteroids, and we’ve found that for a few asteroids, their thermal emission varies more than would be expected from their shapes or how they appear visually. Thermal emission can be studied and any radio or millimeter wavelength, and there are exciting possibilities for this project, using the new eVLA in New Mexico and ALMA in Chile.